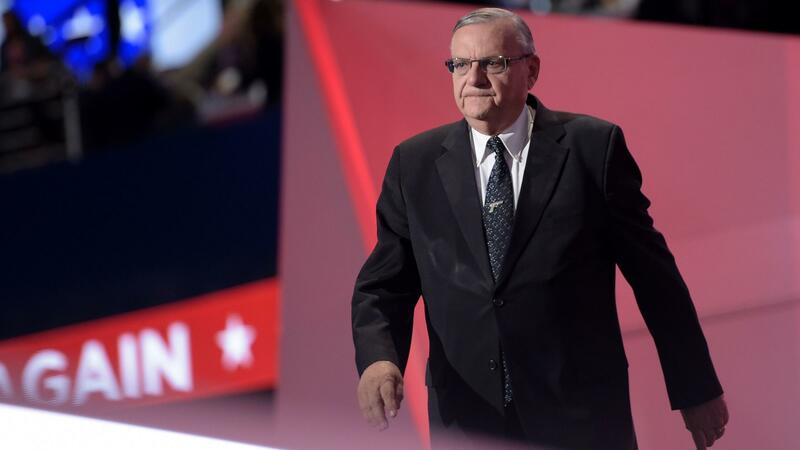 Arizona Sheriff Joe Arpaio spoke in support of then-candidate Donald Trump at the Republican National Convention last summer. Joe Arpaio, the former sheriff of Maricopa County, Arizona, was an early supporter of President Trump and often praises him. But he says he has not heard directly from Trump since the president said he was seriously considering pardoning Arpaio on a recent conviction for criminal contempt of court. In an interview with NPR Thursday, Arpaio said he would be honored if Trump follows through. And he welcomed the idea of Trump holding a planned campaign rally in Phoenix Tuesday, despite concerns by the mayor and others that it would inflame emotions after the violence in Charlottesville, Virginia. He said he hadn't yet been invited to the rally, but held out the possibility that he'd been in contact with others at the White House. Trump told Fox News earlier this week that he was "seriously considering" a pardon for Arpaio. He called the sheriff "a great American patriot" and said he'd done "a lot in the fight against illegal immigration." The administration announced the president would hold a campaign style rally in Phoenix next Tuesday, and the president posted a link for tickets. "It makes me feel good that at least someone is backing me up. And how much better can you get than president of the United States?" Arpaio said. Phoenix Mayor Greg Stanton, a Democrat, released a statement Wednesday urging Trump to reconsider holding Tuesday's rally. He said if Trump was coming to Phoenix to pardon Arpaio, "then it will be clear that his true intent is to enflame emotions and further divide our nation." Arpaio, now 85 years old, believes he and the president have both been unfairly smeared as racists. He predicts Trump will end up being regarded as the greatest president in American history, "We need him and I feel sad how they're trying to destroy him. It makes me sick. I'll tell you one thing he's got guts and courage and that's what this country needs." The self-styled "America's Toughest Sheriff" has been having a tough time of it lately. After becoming America's former toughest sheriff after losing his latest re-election campaign in November, he was convicted last month of criminal contempt by U.S. District Judge Susan Bolton for "willfully violating an order of the court" to end his deputies' crackdown on immigrants. The sheriff believed he had the legal right to instruct his deputies to detain Hispanic drivers and pedestrians and inquire about their legal status. The federal courts had previously disagreed, and the judge found that Arpaio knew he was violating their order when his deputies continued doing it. Arpaio will be sentenced in October. He faces a possible six-month prison sentence. Arpaio made a national reputation for himself out of the way he treated prisoners, housing them in tents in triple digit temperatures, forcing them to eat recovered food, and to wear pink underwear. Chain gangs were his specialties. But it was the creation of an immigration posse that created legal consequences for the sheriff-- thousands of citizens who were enlisted to help Maricopa County deputies enforce immigration law. The federal courts slapped the sheriff down and stripped him of his immigration enforcement authority. Arpaio's posse eventually disbanded. "As far as the situation on a pardon, I didn't ask for it but I will accept it if he does do it," Arpaio said. "This president understands what I've been going through. There aren't many politicians around believe me. I learned that real quick over this situation. You don't see anybody next to me and I've endorsed so many people." Arpaio hinted that if he's pardoned he'll consider running for office again. "I've got a lot of options out there. I'm not going away."